Suraj Vaidya, chairman, SAARC Chamber of Commerce and Industries, has said that Nepal can achieve economic goal if all the political parties in the country will make economic development as their political agenda. while addressing a press conference organised to inform about the activities of the SAARC Chamber, Vaidya former president, FNCCI, said that SAARC is not only India and Pakistan as there are other countries as well. In every SAARC Summit, we look forward through a political angle on how the prime ministers of India and Pakistan shake their hands but we have never given priority to the economic agendas, said Vaidya. Vaidya said that as the SAARC member-countries are engaged in political agendas, the economic agendas have been over-shadowed. 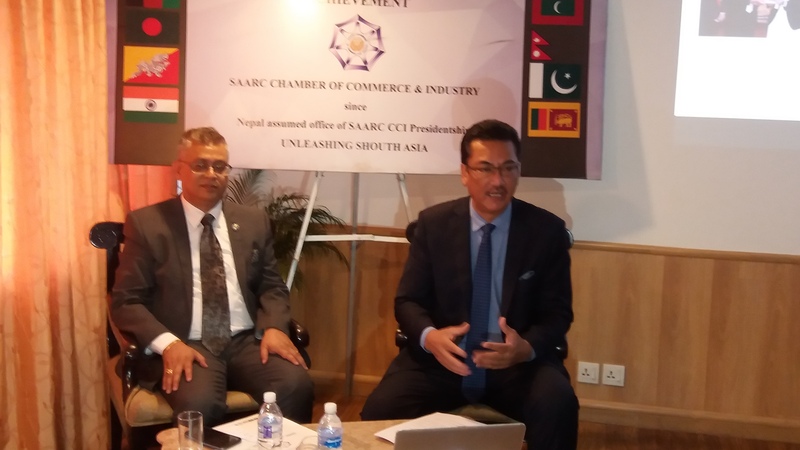 The new team in the SARC Chamber has focused on drawing attention of the SARC member countries towards the economic agendas, SAARC Chamber chairman Vaidya said while reviewing his 100 days in office. To implement our economic agendas, we are not only drawing attention of the SAARC member countries but also knocking the doors of the World Bank, IMF, ADB and also other countries interested to support SAARC countries,” Vaidya explained his plan. Talking about Nepal’s economic scenario, former president, FNCCI, said that political instability, non-cooperation from the bureaucracy, terror created by the trade unions are the major obstacles for economic development. Vaidya has dreamed to establish an Infrastructure Industrial Park in Nepal but the government is reluctant to even provide land. In Bhutan, Pakistan, Sri Lanka, Afghanistan and India, when this plan was proposed, the governments in these countries immediately assured to provide land for establishing such parks but in his own country, Vaidya was unable to get land, he explained his bitter experience. Within the 100 days, Vaidya’s team visited all eight member countries and organised interaction programs with the government officials and business leaders. From such interaction programs, Vaidya’s team was able to draw attention of the concerned country in focusing on the agenda of economic development. The Afghan government has provided 150 acre of land to establish the industrial park. Afghan government and the business entrepreneurs are eager to transform the conflict ruined country as an industrial hub, said Vaidya. Likewise, the Pakistan government had provided 200 acre of land to establish the industrial park, Vaidya briefed. “Economic prosperity gives a country political stability, therefore, economic development is important” he said and added that the government should focus on economic development. To make prosperous Nepal, the Chamber has decided to construct the Chishapani Hydropower Project, Vaidya announced. “Our working style is different. We don’t demand the government but we want to invest in the government’s priority projects,” Vaidya said. Vaidya shared the experience of Maldives in development of tourism sector. He urged to the Nepali tourism entrepreneurs to learn from Maldives. SAARC Chamber may not be important for other countries but for land-locked countries like Nepal and Bhutan , it is very much important to export their products in other countries, Vaidya informed. There is a huge fund in SAARC Development Fund. We can utilize this fund for economic development in the SAARC Countries, Vaidya said. The SAARC CCI building is going to be completed in 2017 in Islamabad, Vaidya informed. Likewise, in Mumbai, Colombo and Dhaka, SAARC CCI is establishing regional offices, he informed. Talking about his future plan, Vaidya said that he wants to establish Buddhist Circuit in Nepal, besides the construction of the Chishapani Hydropower Project. Furthermore, he wants to develop regional air connectivity and develop SAARC tourism markets. Finally, Vaidya said that SAARC CCI talks about economic development not the political issues.